Pneumonitis: What is it and is it contagious? Pneumonitis refers to lung inflammation from non-infectious causes, for example, chemical pneumonitis or hypersensitivity pneumonitis after inhalation of irritant gases, drug-induced and radiation-induced pneumonitis . Lung inflammation caused by microbes is called pneumonia. Chronic symptoms, which may last for several months, can include a cough, finger clubbing and weight loss. Chemical pneumonitis can develop after inhalation of toxic vapors and fumes from household products containing bleach and chlorine, gases produced during welding or smelting, solvents, gasoline, kerosene, pesticides, dust from grains, fertilizers or smoke from fires. Chemical pneumonitis complicated by an infection is called chemical pneumonia. Aspiration means an inhalation of a solid or liquid material into the lungs. Aspiration pneumonitis can develop after aspiration of saliva, gastric acid, food, vomit, activated charcoal, water (during drowning) or other foreign bodies, such as detached teeth or parts of dentures. Risk factors include impaired gag reflex, gastroesophageal reflux disease (GERD), vomiting while severely drunk or unconscious (general anesthesia), dental procedures, difficulty swallowing or impaired esophageal motility (achalasia) due to neurological disorders, and impaired immunity [10,12]. Aspiration pneumonitis complicated by an infection is called aspiration pneumonia. “Dust pneumonia” is a term for a non-infectious lung inflammation caused by silica fiber or other irritants in the dust; it was common during the period of frequent dust storms known as Dust Bowl in the 1930s in the United States . Exogenous lipid pneumonia can develop after aspiration of lipid droplets during “oil pulling” or swishing (a “detox” method), petroleum jelly, oil-based nose drops or laxatives (mineral, castor or paraffin oil) . Endogenous lipid pneumonia or “cholesterol pneumonia” can develop after the obstruction of small airways (bronchi), in which cholesterol from the broken bronchial lining cells appears in the airways distally of the obstruction . Pneumonitis can occur as an adverse reaction to drugs, such as amiodarone , antibiotics (nitrofurantoin), aspirin, chemotherapy (bleomycin, bortezomib, busulfan, carmustine [BCNU], cyclophosphamide, methotrexate), cocaine, gold, interferon, penicillamine, phenytoin, procarbazine, sulfasalazine and the supplement L-tryptophan [8,19]. 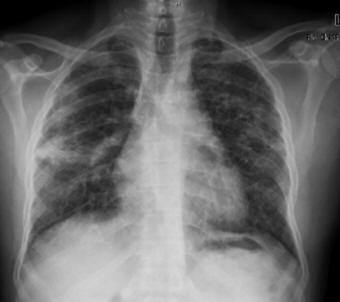 Radiation-induced pneumonitis may develop 1-3 months after completing chest radiation for breast or lung cancer . Fungi (Aspergillus, Candida) in the hay, grains, malt (beer production), wood, maple bark, room humidifiers, cheese, coffee, tobacco, cotton, potatoes, grapes, mushrooms, fish feed, sausages, etc. Various forms of HP can be named by circumstances in which they develop, for example, “farmer’s lung” or “bird fancier’s lung.” Farmers, gardeners and workers in wood, food and chemical industry, saunas and hot tubs are at increased risk. Afebrile Pneumonia Syndrome (APS) is a mild disease in infants <6 months of age. Children’s Interstitial Lung Disease (ChILD) is a group of diseases that affect the spaces between the air sacs. Necrotizing pneumonitis is a severe complication of community-acquired pneumonia in children. When you see a person with a sudden severe shortness of breath and cough who has possibly inhaled dust or toxic fumes, move him or her away from the irritants and call an ambulance immediately. X-ray can reveal nonspecific patches; high-resolution CT (HRCT) is more specific . Other investigations: blood gases analysis, lung function tests, bronchoalveolar lavage and lung biopsy and histological examination . Mild pneumonitis can heal spontaneously and completely in few days. Severe pneumonitis can lead to complications, such as acute respiratory distress syndrome (ARDS), pneumothorax, lung abscess or death [12,13,18]. People who are sensitive to various irritants should avoid them or at least wear protective masks. 2 Responses to Pneumonitis: What is it and is it contagious? I was wondering if you have a definition of nonspecific interstitial pneumonitis? It can be called pneumonia or pneumonitis. There are 2 types (fibrotic and cellular), which are shortly described here.